This lesson will really get your students actively engaged. 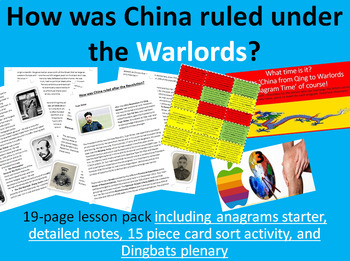 They begin by figuring out the anagrams of key terms and phrases from the course before working through a detailed set of notes on how China changed after the 1911 Revolution. From here students proceed to complete a 15 piece card sort, arranging them into social, political and economic impacts of Warlordism. Students then complete the lesson with a fun activity (Dingbats) designed to test how well they have understood the key vocabulary and events from the lesson. This lesson was one I created and planned while teaching in China so I really invest as much precision in the historical detail as possible. I hope your students enjoy it as much as mine.